Explore the Kadavu Group and go snorkeling or diving. This area is known for being under-developed, but that’s why it’s so special. With an amazing interior teeming with all sorts of birds and jungle creatures, dotted with spectacular waterfalls and mangroves you may like to kayak through. The lush, green city of Suva is home to around half of this group’s population and plenty of rainfall. The colonial downtown is full of wonderful discoveries - tiny alleys lined with curry houses and sari shops for example, the local parliament, temples and a fantastic market. Zoom around the treetops with Zip Fiji, the South Pacific's largest zipline. With sensational views, and plenty of adrenaline - it's an activity that's great for visitors of all interests. Unwind at the Sabeto Hot Springs and Mud Pool. Visitors are able to enjoy the rejuvenating properties of the mud and relax with a massage. 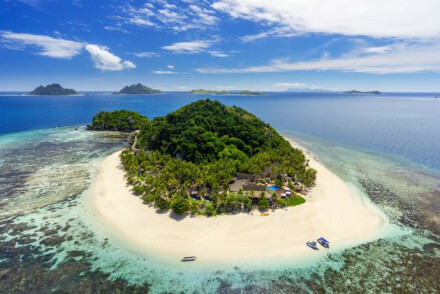 The best places to stay in Fiji cater to all tastes and budgets, whether you're looking for a honeymoon hideaway or cheap (ish) beach resort. 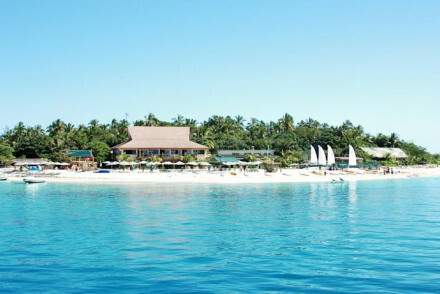 Fiji is a classic honeymoon destination and the Matamanoa Island Resort is a quintessential honeymoon hotel. There are 42 rooms arranged in colourful villas around private pools and overlooking a pristine child-free beach. There’s a treetop spa and a great restaurant. If you love the idea of staying on your own private island, the Laucala Island Resort offers just that - albeit with a small selection of other guests and staff to look after you - around 300 staff looking after around 50 guests. There’s five star dining, an 18-hole golf course and a fleet of private yachts. The First Landing Beach Resort & Villas is a collection of 40 rooms in light, airy villas with high ceilings and a nautical feel - which is in reference to this being the spot where Captain Cook first landed on Fiji. You’re right by the beach with access to the marina and there’s a great restaurant. Rooms start from around £80 per night. 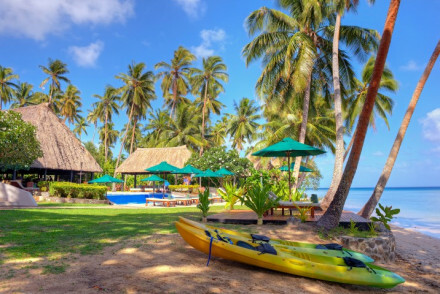 If you’re travelling to Fiji to enjoy an idyllic beach holiday then the Beachcomber Island Resort is a great value option. It’s on a tiny, and relatively recently developed, island with 38 comfortable rooms literally a stone's throw from the clear sea. 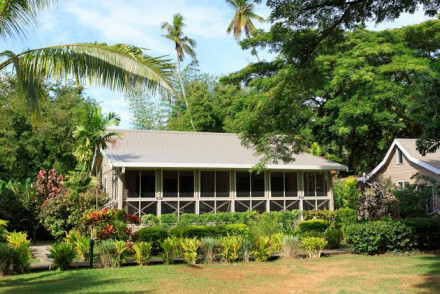 The Maravu Taveuni Lodge is located five minutes from the airport, this restorative eco lodge is located on the incredibly fertile Taveuni Island, perfect for outdoorsy types. Rooms are comfortable plus there is an inviting pool and sun terrace. There are some great excursions in the area including waterfalls and boat trips. If you'd prefer your own space, visit our online partner Booking.com for a variety of stunning apartments and villas. Fly to Nadi International Airport, with a range of international connections to destinations such as Australia and New Zealand. Travelling by bus is often one of the best and safest ways to negotiate Fiji's roads - with a range of bus options available. 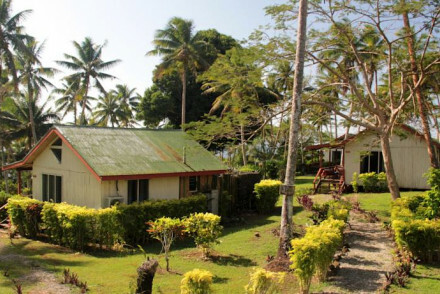 Located five minutes from the airport this restorative eco lodge is located on the incredibly fertile Taveuni Island. Perfect for outdoorsy types. Rooms are comfortable plus there is an inviting pool and sun terrace. There are some great excursion in the area including waterfalls and boat trips. Diving - Speak to the hotel concierge about arranging a dive trip. Fishing - Catch yourself a fish supper. The very spot Captain Cook landed on his exploratory voyage. Decor is light and airy. Villas feature high beamed ceilings, some with pool and bathrooms with nautical accents. Right on the beach with direct access to the marina. Plenty of activities and an extensive menu: a great option for families. Diving - The hotel concierge will help you book a diving excursion. Sailing - Island hop to nearby Yasawa and Mamanuca. Fishing - Fish for wahoo, marlin and mahi-mahi. Beach island resort attracting a young party going crowd. Located on the tiny and recently settled Mamanuca Islands providing basic but comfortable beachfront accommodation. All you need literally within a stone’s throw. Great coral diving and clear water for swimming. Fishing - Sail Fish, Marlin, Barracuda, Giant Trevally, Tuna and MahiMah can all be found in these seas. Diving - There are on site dive intructors. Strictly for grown ups, the perfect spot for honeymooners. Colourful villas feature private pools and charming exposed beams. The treetop spa, Senaki, is a real treat. Pristine waters and white sandy beaches make it ideal for diving. Food is fresh with lots of fish dishes. An idyllic spot. Diving - Head out with your certified instructor and swim with hawksbill turtles. Sailing - There are hotel boats for guests to charter. Restrictions on children - Over 16s only. Previously a coconut plantation, this eco resort comprises 25 villas set amid lush coconut palms with beach views. Many activities such as diving, kayaking or boat tours, guided hikes and kids' activities. Especially renowned for its diving school, a relaxing base from which to explore. The ultimate jet set getaway: your very own private island. 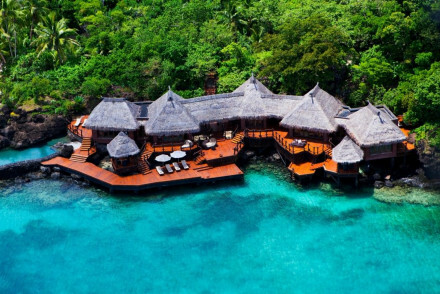 In the highest class Laucala Island Resort really has it all. Five star spa experiences, fine dining, 18-hole golf course and private villas - plus 300 staff for 50 guests. You get the idea. Has to be seen to be believed. Diving - Get up close and personal with hawksbill turtles, angelfish and much more. Hideaway - Your very own private island. You can't get more of a hideaway than that! Kayaking - There are kayaks available for guests to explore the seas and lagoons. Sailing - The island has its own private fleet of yachts.